THE British government is likely to trigger article 50 early next year, Foreign Secretary Boris Johnson has claimed. But Downing Street has refused to confirm Johnson’s unusually frank statement on the move, which would kickstart the process of Britain leaving the European Union (EU). Once article 50 is invoked, Britain has two years to negotiate a withdrawal from the EU. Johnson said the government is ‘talking to our European friends and partners now in the expectation that by the early part of next year you will see an article 50 letter’. He added: “We will invoke that, and in that letter I’m sure we will be setting out some parameters for how we propose to take this forward. However, Prime Minister Theresa May, who has been annoyed with ministers making statements on how Brexit might play out, was keeping her cards close to her chest. This is the man (great photo btw) who vociferously didn’t want Turkey to join the EU before the referendum, and after the referendum is now shaking hands with President Erdogan, saying he wants Turkey to join. Brexiteers really do make it up as they go along lol. OP where did you get that picture!!! Poor old Boris is really losing it, I used to think he had a brain but didn’t use it well but now I am beginning to wonder. 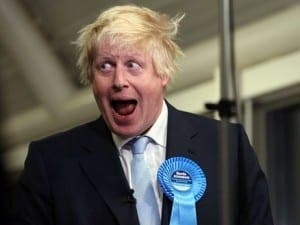 He only supported the Leave campaign to boost his credibility among UKIP voters but he didn’t really want to win, he wanted to be the gallant loser and future Prime Minister who tried to get the UK out of the EU but it backfired on him, badly. He seems to be failing on all fronts at the moment. The photo accurately shows the man within.